Better access to medicine through our home delivery service expanding throughout the state to patients and caregivers. 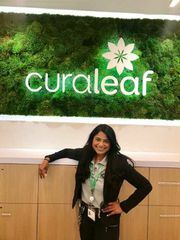 Contact your local Curaleaf dispensary to find out more about becoming a patient or referring a patient today. "Very clean and welcoming. Janet was very patient and listened to all our concerns and answered all our questions. Happy to go back soon!" "As a new medical cannabis patient, I had a LOT of questions. Brett spent about an hour and a half patiently educating me and addressing all of my concerns. I am so grateful for his kindness and understanding and for all of the valuable information he provided. Great facility and staff. Senior discount, too!" "I had just picked up my certificate and went to Curaleaf to schedule an appt with a pharmacist. She went above and beyond. She got me registered, got me a temp card and was able to use it for purchases that same day, instructed me on what and how to use. Love these people. Thank you all"
"Newburgh is a great place to go if you choose to add MMJ to your wellness program. Their friendly staff extremely knowledgeable about alternative medicine and will assist you on your path to better living. I am eager to try the many choices of CBD products as I understand they hold significant health benefits. I highly recommend their products and services." "Helped my mother beyond words. Since we started using Curaleaf she has been able to get off a lot of her and her quality of life has drastically improved. CURALEAF is affordable, high quality and a pleasure to work with"
"I am honestly upset that I didn't find out about Curaleaf earlier. Etain and Vireo health drained all of my money and I am furious how much money I wasted on basically no product. Do yourself a favor and switch immediately to Curaleaf if you have not taken the drive to Newburgh yet.... DO IT"
"I’m always greeted with a hello and a smile. You can’t help but to be comfortable in a place like this. They put your mind at ease and give you all the information you need in order to combat your ailments. Service is and kind to all that come through the doors. And the prices are fabulous! And the rewards program is a big plus! They will always get my business!" "Thanks to medical marijuana I was able to return to work and I can again enjoy taking part in the lives of my grandchildren. In the past, I missed so much." "My GPS originally took me to the wrong building and I have to admit I was nervous. Thought it was a sketchy basement of someone’s house next to a sketchy deli that sell gluten free sandwiches. Once I finally found the place, how it can be missed is beyond me, I was thrilled. I am used to street parking at Etain or Vireo. So to have a parking LOT terrific already. The building is nothing to be disguised, if you don’t want people knowing you have a medical marijuana it might be tough to hide it here because the building is completely glass, windows everywhere. I walk in, to the vestibule, greeted by a very friendly couple of front desk gals and a lovely security man. After registration I had the pleasure of meeting and chatting with Charles about my condition and level of pain and discomfort. He advised me what to get. I decided on the vapor pen because I have children at home and having liquid or capsules around isn’t feasible. Although Tylenol is more dangerous in high amounts to someone than marijuana. Anyway - I get home and try out this new (I call it) puffer. One puff and I feel no part of my body. I got this for stomach pain and muscle relaxation of my stomach for when I want to actually eat good food (IBS), and it got rid of my 4 day sinus headache as well. I have never tried a product that had THIS much relief. Nothing Vireo or Etain sells has this effect. I am THRILLED I found this place!" "They make everything so easy! From check in to check out! All questions are answered no matter how silly you may think they are. Everyone who works there is so friendly, super knowledgeable and just amazing! Have no fear! Get to feeling better HERE!!!!"